Due to popular demand, Southeast Asian Airlines (Seair) is increasing their daily flights up to 32 per day. This means more chances to go to Boracay! This is in line with SEAIR’s mission of helping the Philippines’ tourism development, especially tourism to the island of Boracay. SEAIR has been serving this route since 1995 and has the longest history of uninterrupted service to Boracay direct via Caticlan. SEAIR’s fleet of DO328’s and LET410’s have proven very good performance in short runways. “Our aircraft, the Dornier 328 and LET L-4110, are both capable of Short Take-Off and Landing (STOL). They are aerodynamically designed in a way that it is capable of landing and taking off in about 750 meters with full pay load. These aircraft are the most appropriate for small runways where bigger commercial airplanes cannot land,” said Avelino Zapanta, SEAIR president. You know what’s even better? I did a quick check for fares over at the Seair website, and I was able to find round trip tickets from Manila to Caticlan for only Php716.80! That fare already comes with the complimentary transfers from the Caticlan airport to the jetty port to Cagban port in Boracay Island, and back again. Talk about great value. Now isn’t that reason enough to hit the beach? Also, the great thing about flying Seair is that there’s hardly ever a long line at the check in counters, check-in baggage are quick to be taken out of the aircraft and flights to and from Boracay can be as short as 35 minutes! Mas matagal pa ang byahe ko from my house to the airport! Are you based in Cebu? No worries, Seair got you covered. Seair has recently relaunched the Cebu-Caticlan route, with flights every Fridays, Sundays and Wednesday. Perfect schedule for a weekend getaway. Fly SEAIR and rediscover the joy of flight – speed, convenience, personalized Service! Go to www.FlySeair.com for the best deals or call SEAIR Manila at (+632) 8490100 and SEAIR Cebu at (+6332) 2549337 to 38 for more information. buti naman binalik na ang cebu-caticlan route. na suspend kasi mga flights even for other airlines. This is great information thank you very much. 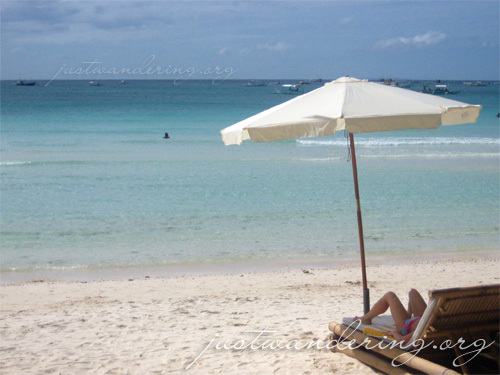 Boracay looks beautiful and i have heard alot of great things about it.